Regardless if you have time off for the holidays, or you will be trying to get everything hung or taken down on a weekend, taking care when removing or hanging holiday decorations is a must. More often than not, our roofing professionals in Michigan make roofing repairs caused by putting up or taking down holiday decorations. We want to make sure you know how important it is to take care when doing your decorations this year! You may not think about it when you are hanging your decorations, but you can easily cause damage to your roof. Many times homeowners will use their roof or gutters for leverage when they are hanging decorations. Doing so can cause gutters to fall, or the edges of your shingles to break away. Also, if you are relying on gutters to hold you up while you hang your lights, your safety may be at risk. Another common mistake is to lean your extendable ladder against your roof. This can also cause shingle or gutter damage during the winter. Be sure to use adhesive plastic hooks to hang your lights. They are not recognizable, and can even stay up for a few years. Using nails or screws to serve as a place to hang your lights can also cause damage, by creating small holes which may result in leaks. Take caution in the amount of weight that you add to your gutters, remember that heavy snowfall or ice already can wreak havoc on a gutter system. 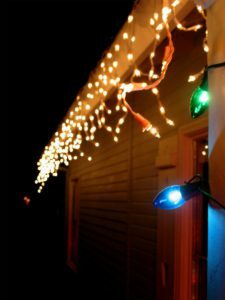 Be sure to think twice about how you hang your lights. Ask yourself “will this cause damage to my roof?” If you think it may, they choose a different option. The same goes for removing holiday decorations. Take care when doing so. Be sure you don’t just go ripping down the lights. Not only will this ruin your holiday lights, but it can also rip down gutters. If you have already experienced roofing damage due to holiday decorations, contact us today. It is important to make sure your roof and gutter system is in tip-top shape before the snow begins to fall! Schedule A Pre-Winter Roof Inspection Today! This entry was posted in Gutters, Roof Inspections, Shingles and tagged avoiding gutter damage, avoiding roof damage, hanging holiday decorations, pre-winter roof inspection, protect against shingle damage, removing holiday decorations. Bookmark the permalink.